Environmental Protection Agency head and fossil fuel shill Scott Pruitt is a simple man. He likes denying climate change, obscuring the thousands in campaign funds he’s received from the fossil fuel industry, and denying climate change some more. Bloomberg reported Thursday morning that Pruitt is now saying he doesn’t believe the overwhelming scientific consensus that CO2 is the primary contributor of global warming. What a convenient viewpoint to take when your oil buddies want you to deregulate carbon emissions! Pruitt’s long been a climate skeptic, writing that the climate change debate is “far from settled,” and wouldn’t relent during his confirmation hearing to lead the agency. When Bernie Sanders asked him what caused global warming, Pruitt said CO2 from human activity “impacted,” rather than “caused” climate change. Did it matter that the prospective head of the EPA disagreed with the scientific community about what causes global warming? 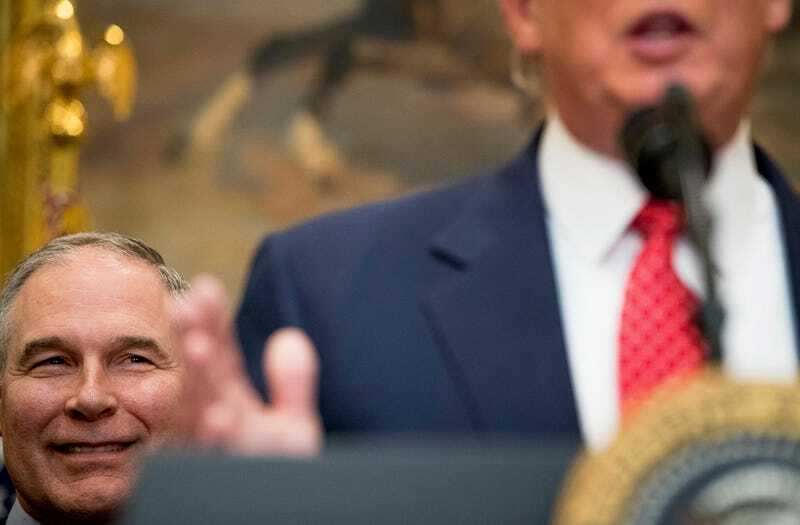 “My opinion is immaterial,” Pruitt told Sanders. There may be an even more insidious political reason behind Pruitt’s patently ignorant statements. Seemingly, Pruitt is trying to push against the landmark “endangerment finding” from 2009, where the Supreme Court agreed with an earlier EPA finding that greenhouse gases threaten public health, and ruled that the EPA must implement policies that protect people from the dangers of carbon emissions. Essentially, the EPA concluded that the planetary changes threatened by global warming, including an increase in the number of extremely hot days and extreme weather, pose a serious threat to current and future generations. The decision that carbon should be regulated as a pollutant enormously expanded the EPA’s regulatory powers and its ability to enact regulations and penalties for polluting companies. The endangerment finding is somewhat of a failsafe against EPA deregulation. Pruitt, as Oklahoma Attorney General, filed dozens of lawsuits aimed at scaling back the Clean Power Plan and the Clean Air Act, both of which give the EPA regulatory power over carbon emissions. Even as the EPA lead, it’d take years for Pruitt to fully repeal or scale back either law, but the endangerment finding is an integral part of the EPA’s ability to stop polluting industries. Pruitt is signaling that he disagrees with the fundamental goals of the agencies as designated by the highest court in the land. Scaling back regulations and helping fossil fuel companies enrich themselves seems the core mission of Pruitt’s EPA tenureship under Trump, who has already green-lit the highly controversial Dakota Access and Keystone XL pipelines, wants to make it easier for coal mines to dump sewage into water sources, and is promising a resurgence of coal mining jobs, despite enormous evidence that coal is in its twilight years. It’s gonna be a long, hazy four years.